It’s our first episode picked out by one of the awesome Rotoscopers’ patrons. 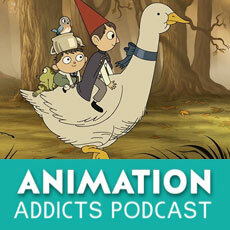 RotoNation member Rachel Wagner selected the 2014 Cartoon Network miniseries Over the Garden Wall for this episode of the Animation Addicts Podcast. Voice cast: Elijah Wood, Collin Dean, Melanie Lynskey, Christopher Lloyd, and more! Don’t forget to use the hashtags #AnimAddicts and #AnimAddicts102 when talking about this episode on Twitter!